Shrimp come in many varieties and are available online fresh, frozen, canned, raw, fully cooked, and in fully prepared entrees. 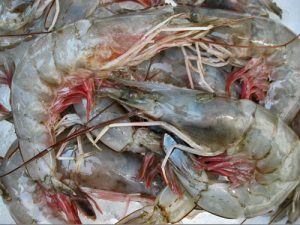 Southern varieties include white shrimp, brown shrimp, pink shrimp, royal red shrimp, and rock shrimp. Several species of shrimp are found in cold ocean waters around the world. Although coldwater shrimp are usually smaller in size than southern varieties, they are highly-prized for their flavor. Northern shrimp are landed in Alaska, Washington, Oregon, Maine, New Hampshire, British Columbia, the Canadian Maritimes, Greenland, and other areas. Along the Pacific Northwest coastline of North America, fishermen harvest spot prawns and other coldwater species from ocean waters. Farm raised shrimp are also popular with consumers. Farmed shrimp and prawns are grown in the USA and other countries around the world.